Succulents are the quintessential opportunists of the plant kingdom, surviving in arid places the world over. They live where rainfall is both infrequent and unpredictable; and over the millennia they have evolved so that they can readily absorb water when it is available, and store it in specially adapted tissues in anticipation of dry days ahead. 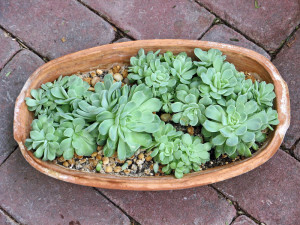 When the word succulent is mentioned, most people think of a cactus. Cacti belong to the plant family Cactaceae, and they are certainly succulents. They store their water in swollen stems. And, both to avoid losing precious water by transpiration and also to help to fend off predators, the leaves of cacti have evolved into fiercely sharp needles. So, in the confines of a small greenhouse, cacti and their skin-piercing armor are not particularly gardener-friendly. By contrast, members of the plant family Crassulaceae, which are also succulents, are much less fierce. They have evolved thick fleshy leaves as their particular water storage medium. The familiar medicinal aloe, Aloe vera, can hold a prodigious amount of water; just cut into a leaf and see how it positively oozes liquid. And although some members of Crassulaceae, like agave, do have spiny edges, they are far less of a liability in the close confines of the greenhouse than the needles of a cactus. 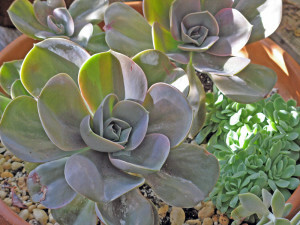 Some leaf-storing succulents are actually quite familiar to northern gardeners. Think about the various Sedum we grow in our gardens, along with Sempervivens tectorum, or Hens and Chicks as it is commonly called. But Crassulaceae is a vast family, and it contains many attractive plants that can be found all across the globe; indeed one could make a life hobby of collecting members of this family. While most are not hardy here in New England, a number of them do make excellent plants for a cool greenhouse. Many (but certainly not all) succulents come from places where the summers are hot and the winters are cool but not truly cold, conditions I mimic in my greenhouse. I started collecting succulents some years back now, when my daughter-in-law took me shopping near their home outside San Diego. We went to a huge garden-center where there were literally hundreds of different plants on display, all selected for a climate that is hot in summer and gets cool but not freezing in winter….not so different from my greenhouse! So I came home with a treasure-trove of unfamiliar-looking plants in three-inch pots (but NO cactus! ), carefully transported across country in my hand-luggage. Unfortunately many of the labels on these plants were vague and unspecific…some saying nothing more than ‘succulent’. So over the years I have played detective, trying to identify my acquisitions. Among them I have found several Echeveria, two Aeonium and an interesting Aloe. 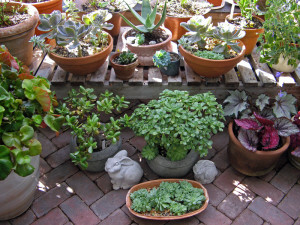 More recently I have enlarged my succulent collection, including Kalanchoe pumilla and the Burro’s tail Sedum, mostly from Logee’s Greenhouses in Connecticut. Greenhouse plants must share tight quarters. So when choosing a set of plants for a greenhouse, it helps to think about how they will look aesthetically when grouped together. I like to know the mature size I can expect a plant to reach in a greenhouse setting, where it will be restrained by a pot, as well as its overall shape and the manner in which it grows. Growing upwards like a miniature tree. Echeveria are delightful small plants from the semi-deserts in Texas, Mexico, and southward to Central and South America. They are characterized by thick leaves growing around the stem as a rosette. And I came home from San Diego with several Echeveria, including Echeveria elegans (which like our more hardy Sempervivum is also known as Hens and Chicks), and Echeveria ‘Western Blue. 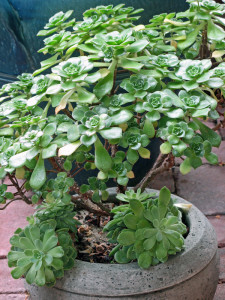 Both these plants are low-growing spreaders that gradually multiply via stem off-shoots; and they make an attractive a ground-cover under a taller companion such as the tree-like Aeonium. Another spreading succulent of note is Kalanchoe pumila, which is very different from the typical ‘Florists Kalanchoe’. Kalanchoe pumila has felted gray leaves that are attractive all year long. And in summer, as a bonus, it puts out a display of pretty frothy pink flowers. 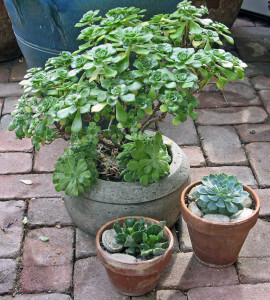 Most people are familiar with the upward growing green Jade Plant succulent, Crassula ovata. On my San Diego adventure I picked out a variety of this same species with lovely orange coloration, Crassula ‘Sunset’. It grown into a delightful tree-like form and has also kept in bounds in a smallish pot. (This is by way of a contrast with my common Crassula ovata that is still growing upwards and outwards even though it is completely pot-bound). The Aeonuim clan remind me of miniature bonsai trees, with their branches coming off a stiff central stem. Their leaves grow as flat rosettes or pinwheels at the ends of these branches, hence its moniker Pinwheel Plant. I have two varieties: the green Aeonium haworthii, and a variety of the same species with attractive orange tipped leaves, A. haworthii variegata. I also have an as-yet-to-be-identified upward-growing Echeveria, whose gray leaves tinged with pink form a pretty bouquet at the end of a gradually elongating stalk. Eventually it will put out some fleshy-looking flowers which I remove, as this seems to signal the end of the growth on that stalk. I then cut off the entire top of the plant and re-pot it in fresh soil, where it re-roots and starts the cycle again. I have raised my succulent collection on a diet of benign neglect, and they have done amazingly well. I use a typical ‘cactus’ potting mix, and let it dry out between watering. An infestation of mealy bugs on a few of the Aeonium and Crassula plants is the the only real pest problem I have encountered among my succulents. They show up as a fuzz looking like white-cotton. Mealy bugs usually appear in hard-to-reach places like in the leaf axil, and for this reason they are difficult to eradicate completely. But with a little diligence I can keep them under control. I start by removing what I can by gently rubbing the affected area either with a cotton-swab dipped in alcohol, or even just plain water. I then treat the plant with insecticidal soap, repeating this weekly.